Waagmeester Awnings & Sun Shades offers residential awnings and sun shades that blend form and function. Control light, maintain temperature, manage weather and improve your home's energy efficiency. ​Add flare and style to your commercial building while making your name and logo stand out to be clearly seen. Waagmeester offers awning and sun shade solutions to exceed the needs of your business. From practical to fantastical, Waagmeester Awnings & Sun Shades designs and fabricates some of the most imaginative and innovate canvas pieces you'll ever see. What you can imagine, we can create! Awnings and sun shades for both residential and commercial customers are at the core of the Waagmeester product line. Custom pieces for home and business owners also make up a significant portion of our product line. We love the challenge of making our customers’ visions and ideas come alive. Check out our dedicated pages for each area of interest by clicking the images above, or scroll down to learn more. There are many factors to consider when looking at awnings and sun shades for your home or business including function, size, appearance and ease of operation, just to name a few. While there are many potential providers for you to choose from, we’re confident our team will go above and beyond industry standards and provide products and customer service that will exceed your highest expectations. 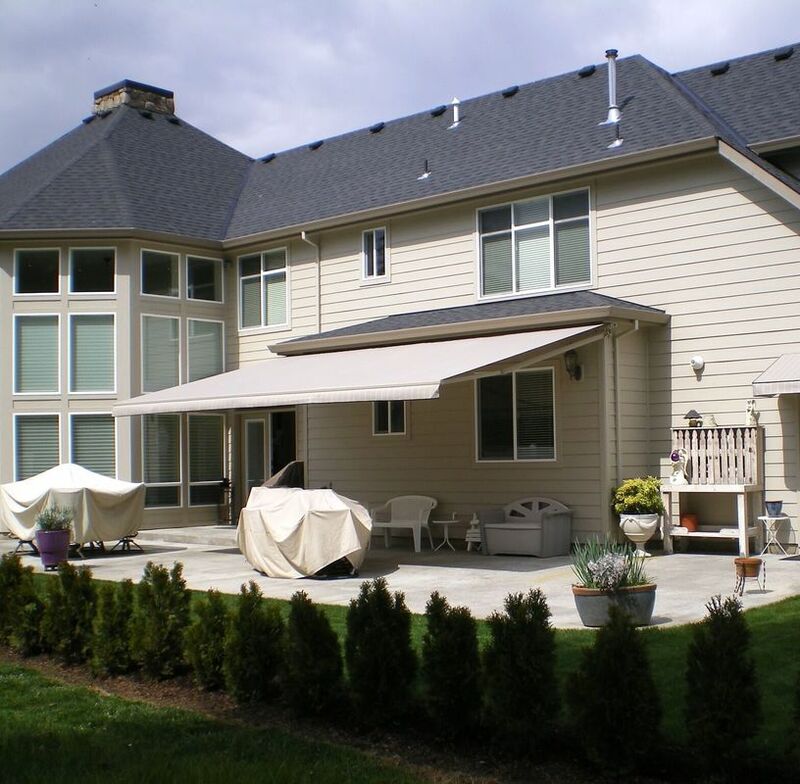 Residential awnings and sun shades from Waagmeester Awnings & Sun Shades help you control light levels, maintain temperatures and provide protection from the elements both inside and out. 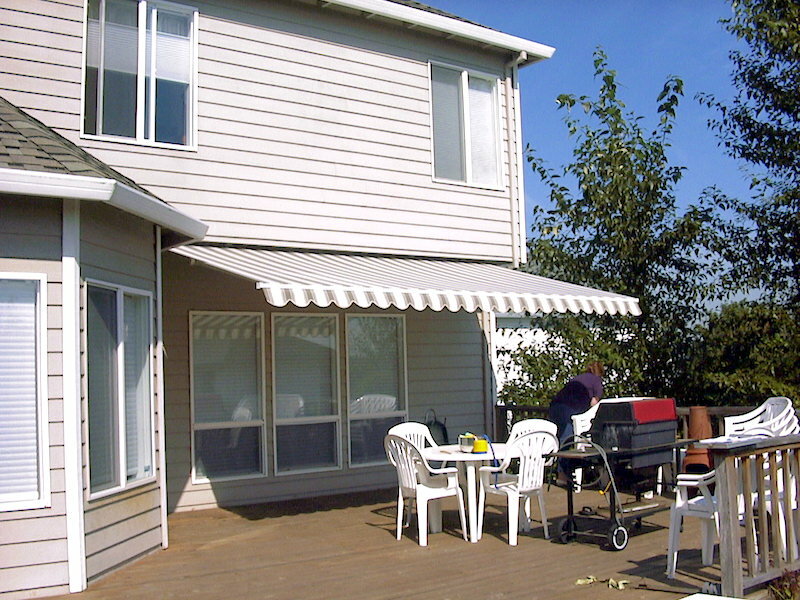 Our durable, high-quality awnings allow you to use outdoor spaces practically year-round. 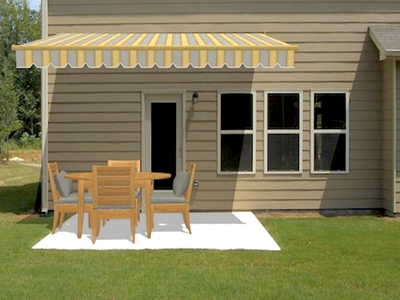 With Waagmeester awnings, you'll enjoy a shaded place on a hot summer day. You can bundle up with a warm coffee on a cool, rainy spring morning or sit and watch the snow fall with a cup of hot chocolate on a cold winter evening – better yet, enjoy the winter wonderland in your hot tub under a Waagmeester awning! 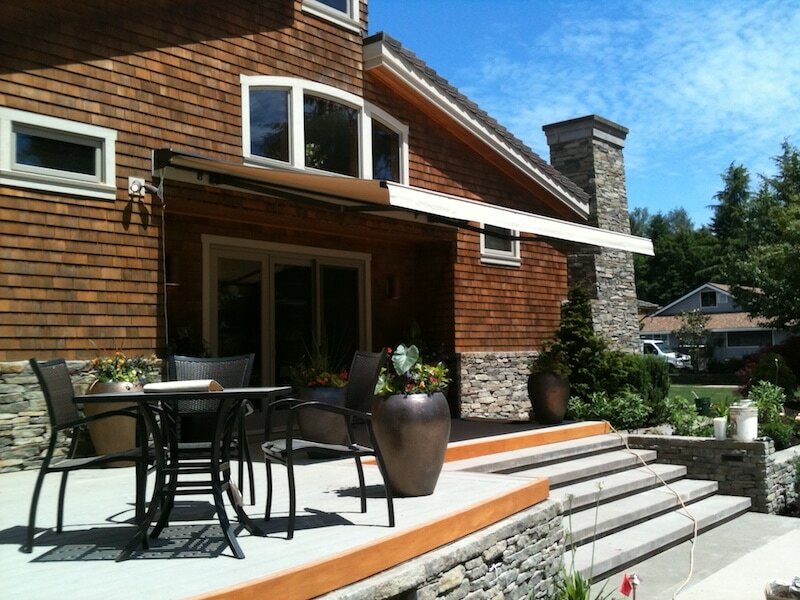 Waagmeester’s stationary awnings are a sturdy way to offer year-round protection from the elements, heat and UV rays. 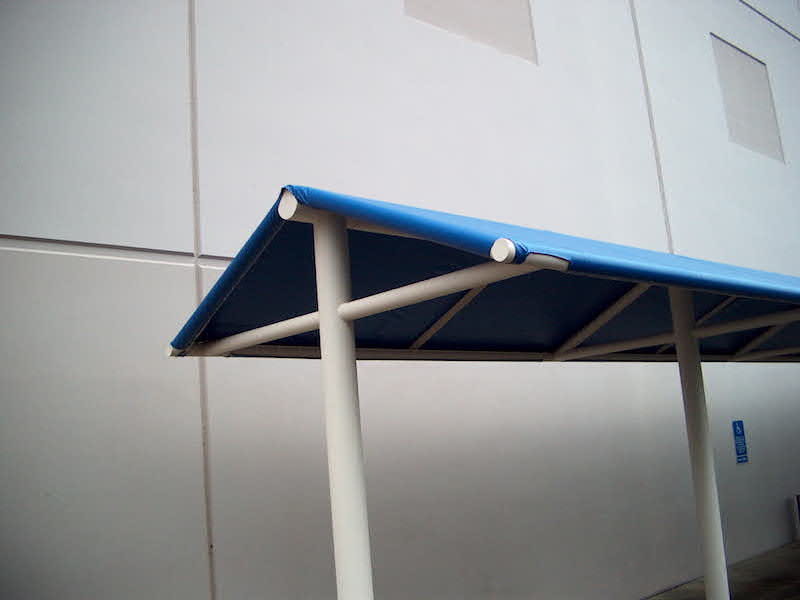 Protect furniture and belongs from fading while enjoying the shelter of a residential stationary awning. Click here to learn more. Waagmeester Awnings & Sun Shades offers residential retractable awnings that are stylish, durable and effective. Easy to operate and available with nearly limitless customization options, Waagmeester awnings are the best in the industry. 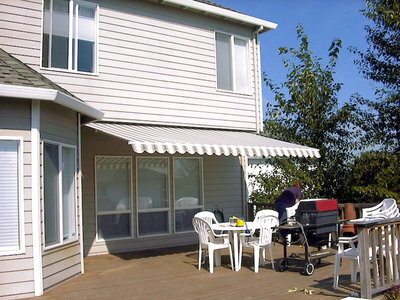 Click here for more on Waagmeester's Residential Retractable Awnings. 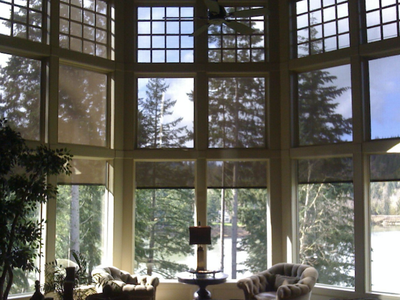 Interior and exterior sun shades give you an easy way to control excess sunlight and heat. 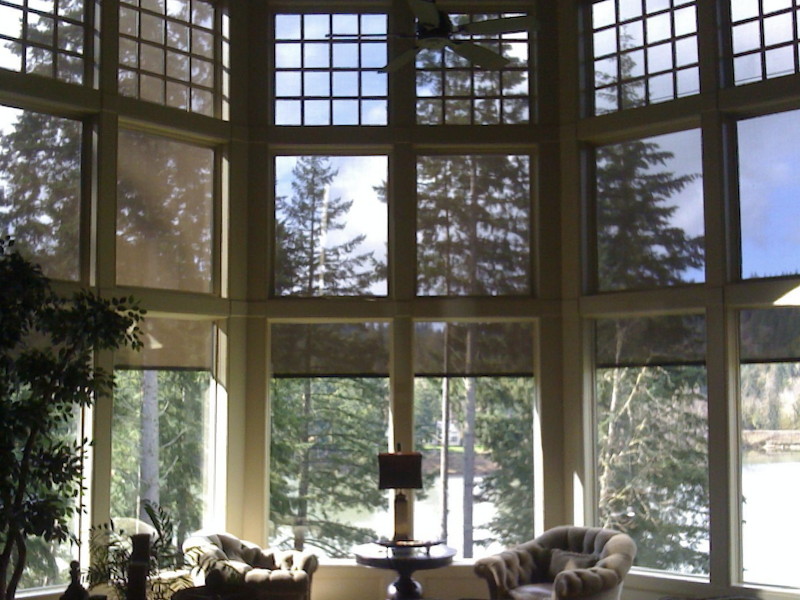 With semi-transparent sun shades, you can control heat and UV rays while still enjoying your view. 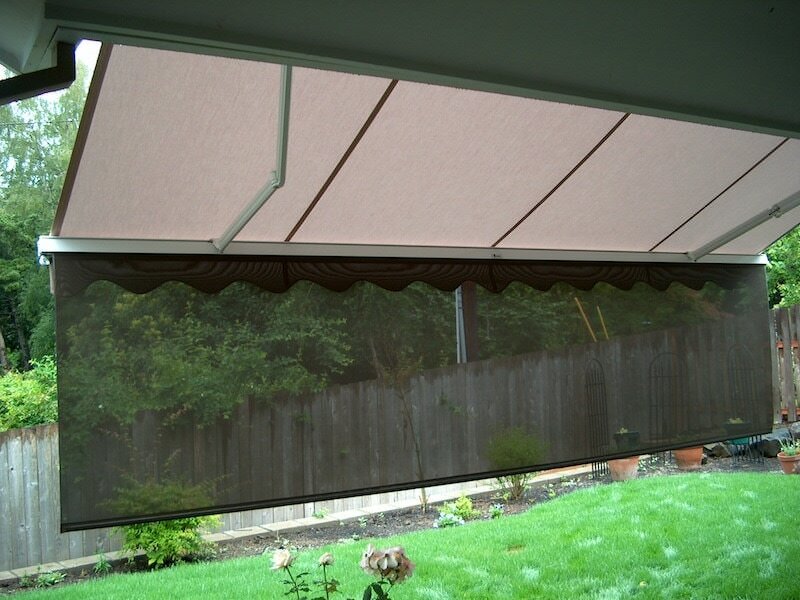 Combining vertical drop sun shades with awnings can offer the maximum protection while allowing you to still enjoy the outdoors. Click here to see some of the options offered by Waagmeester Canvas Products. Exterior curtains for decks, porches and patios can provide heavy duty protection from the elements, allowing you to use your outdoor spaces any time of year. 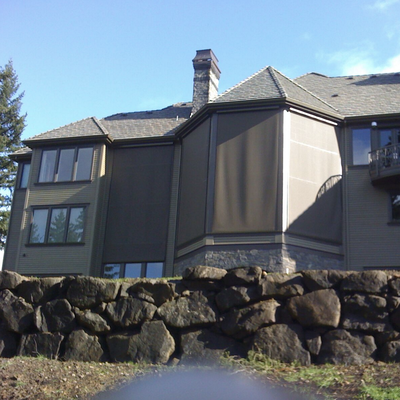 Learn more about exterior curtain options here. If your home has existing retractable awnings, stationary awnings or sun shades, Waagmeester is the top professional team to call for servicing and repair in and around the Portland metro area. 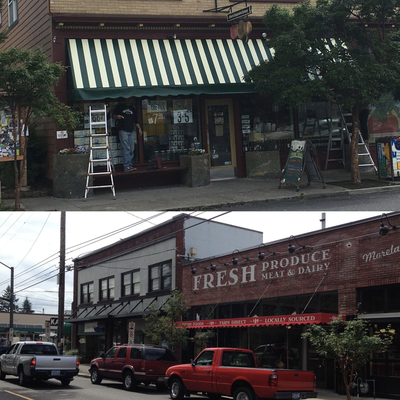 We’re able to repair modern and vintage awnings and sun shades, often at a fraction of the cost of replacement. Contact us to learn more about our service and repair options. Commercial awnings and sun shades from Waagmeester Awnings & Sun Shades not only help you maintain the comfort level of your customers and staff, our products can help your business control energy costs and potentially grow your customer base! Providing a comfortable, enjoyable environment both inside and out lets your customers know their experience is paramount to you. When they can enjoy the outdoors, even when the sun or weather is less than ideal, your location becomes all the more attractive. With our graphics options, your name and branding can be seen clearly from both near and far. Being seen and noticed is critical for businesses in attracting more customers. Add color, vibrancy and beauty to your business both inside and out with commercial sun shades and awnings from Waagmeester Awnings & Sun Shades. 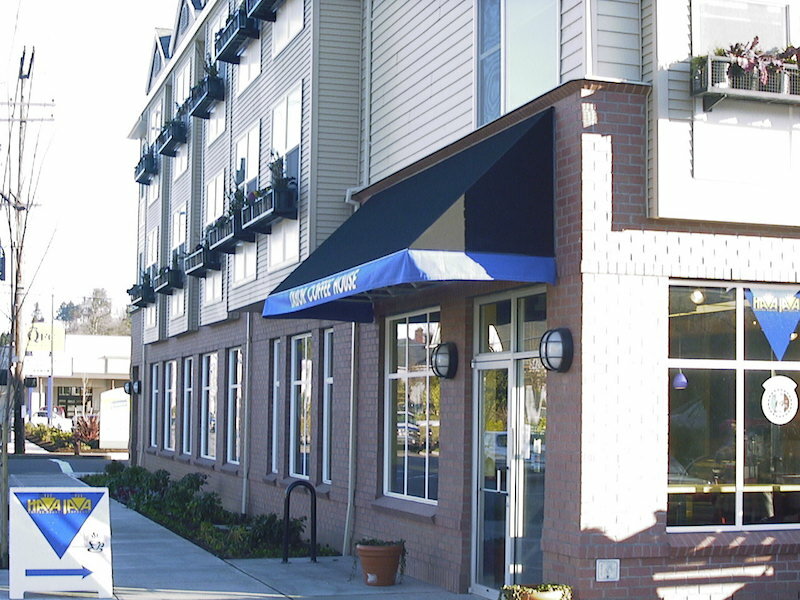 A staple for businesses for decades, stationary commercial awnings offer protection and shade for entry ways, exits, windows and outdoor use spaces. Restaurants, pubs and cafes aren’t the only businesses that will benefit from enhancing their space outside. Click here for more information and see the various options Waagmeester offers for stationary commercial awnings. Retractable commercial awnings are a great way for businesses to give options to their customers and maximize their use of outdoor space like sidewalks, patios and decks. Once you’ve verified your city and municipal codes allow commercial retractable awnings, contact Waagmeester to learn more about the best options for your business. 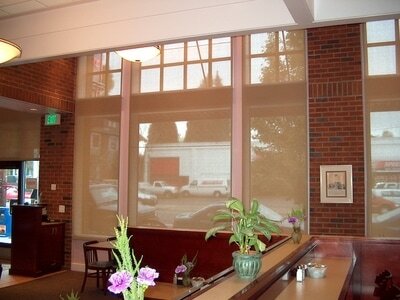 Commercial sun shades offer simple and effective control over sunlight and temperature for your business. Your customers and staff will appreciate that their comfort matters to your business. 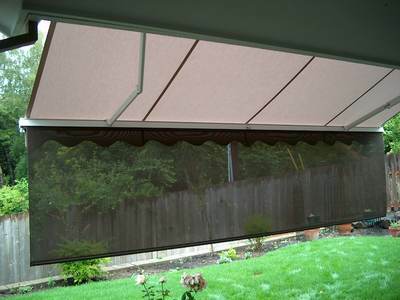 Waagmeester Awnings & Sun Shades offers commercial sun shades that allow you to control light while keeping your view. They can also display eye catching graphics. Click here to learn more. Commercial exterior curtains are an excellent way to continue the use of your outdoor space in inclement weather. While other businesses shuffle their guests inside, the combination of a heat source and exterior commercial curtains from Waagmeester can allow your guests to enjoy the outdoors through the cold and rain. Find out more by clicking here. Commercial shade sails for your business will let your space stand out and shine while controlling excess heat, sunlight and weather elements. 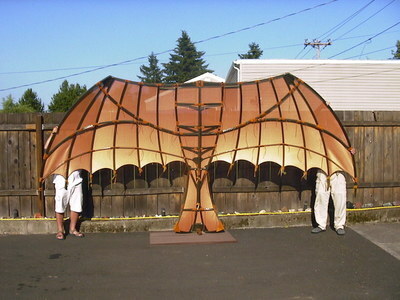 Shade sails also make an artistic statement inside, allowing a business to add warmth, character and even pizazz. As will all our quality canvas products, shade sails can be created with a variety of colors, patterns and can include text and graphics. See more options for commercial shade sails by clicking here. 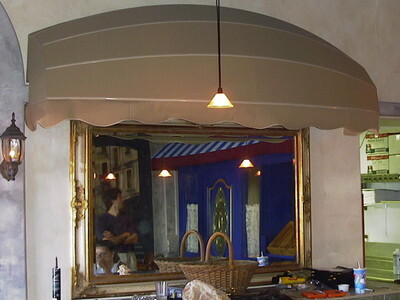 With over 70 years’ experience designing, creating, installing, removing, repairing and servicing all manner of awnings, shades, screens, sails and more, Waagmeester Canvas Products has the knowledge and skill to repair and service existing awnings and sun shades in and around your business. Repairing could be the most cost effective option, and if replacement isn’t necessary we’ll never try to sell you something not needed. It’s all part of our uncompromising approach to providing the best customer service available. 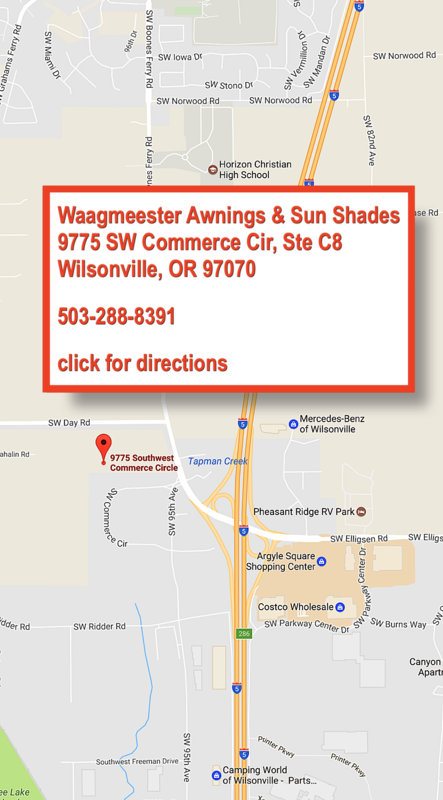 Click here to contact Waagmeester Awnings & Sun Shades for an estimate or consultation regarding repair of your commercial awnings and sun shades. At Waagmeester Awnings & Sun Shades when we say custom we mean CUSTOM. Our products are designed exclusively for you, based on your ideas and specifications. Our expert team will craft your project with the color and pattern choices you desire. 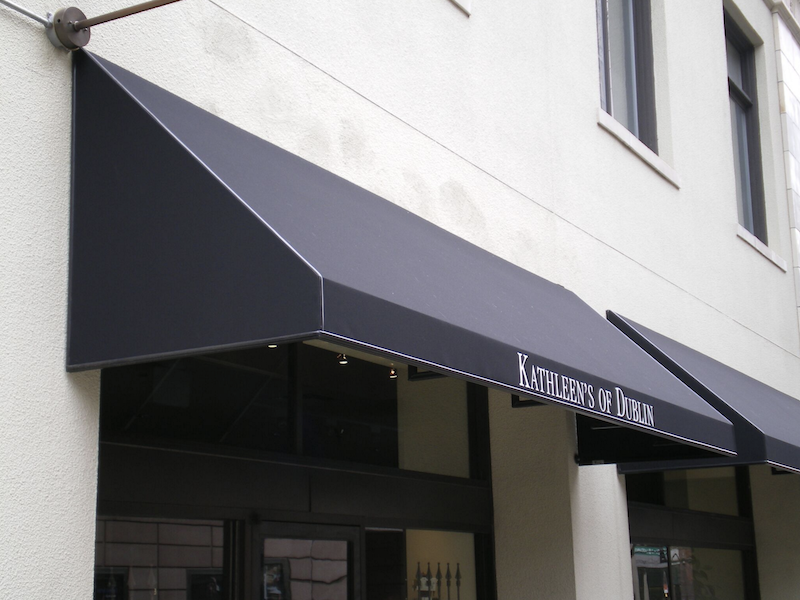 Our awnings and sun shades have numerous options, features and benefits that make each order unique for each customer. Cuts, trims, valance accents, transparency are all things you have control over. And with our branding and graphics abilities, you can put any message, symbol, text or whatever you choose onto your awnings and sun shades. We can even do single sided graphics that can be seen from only one side of the shade. At Waagmeester Awnings & Sun Shades, our commitment to quality is absolute. The awnings, sun shades, shade sails, curtains and custom pieces we design are made by experienced craftsmen at our facility in Wilsonville, Oregon. We use materials that are on the cutting edge of technology and performance. Weather, light, mold, mildew and fire resistant materials that function beyond our customers’ expectations are the norm for our canvas products. The Waagmeester line of products offer style and character to any building and exceed industry standards. 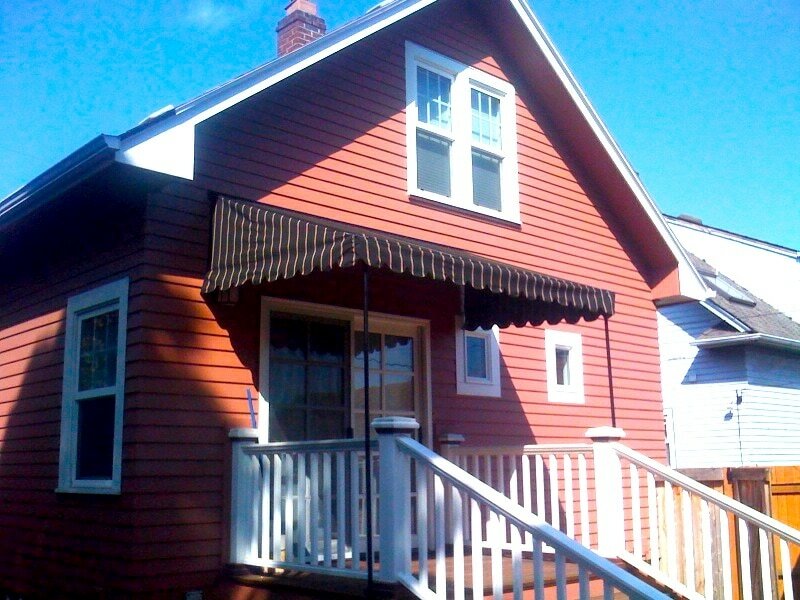 Your home or business will be enhanced and accentuated with Waagmeester awnings and sun shades. Whether you’re looking for exterior additions that blend subtly with your existing color pattern, or you want a bold and exciting addition of character and charm, Waagmeester will custom design and create the perfect accessory for your space. ​WE SHIP TO CUSTOMERS ALL OVER THE WORLD! Sunlight is a beautiful thing and it’s something you want to enjoy in your space. The issue is excess sunlight can create problems of many sorts for both a home and a business. Depending on the positioning of your property, the sun’s rising or setting can make your home or business difficult to enjoy. During the day, excess sunlight can throw off temperatures and drive up utility costs. Waagmeester awnings and sun shades provide protection from the sun’s rays while allowing you to continue to enjoy the light. In your home, reduction of light helps manage temperature and energy costs. It also protects your belongings, furniture and surfaces from fading due to excess sun. In your business, our awnings and sun shades will allow your space to be more enjoyable and useable for both your customers and staff. 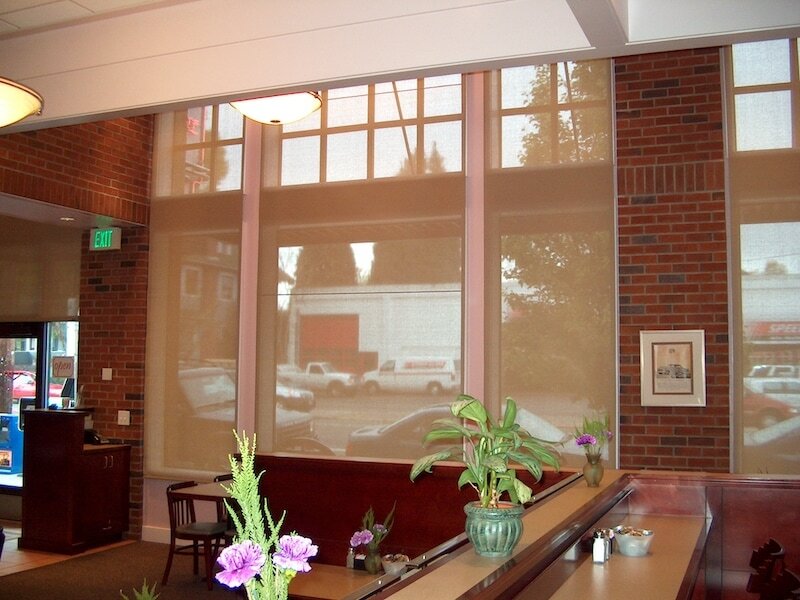 Retractable shade solutions can offer the perfect amount of sunlight throughout the day to anyone on your premises. We’ve all experienced how a big dose of sunlight can drive up the temperature in both indoor and outdoor areas. 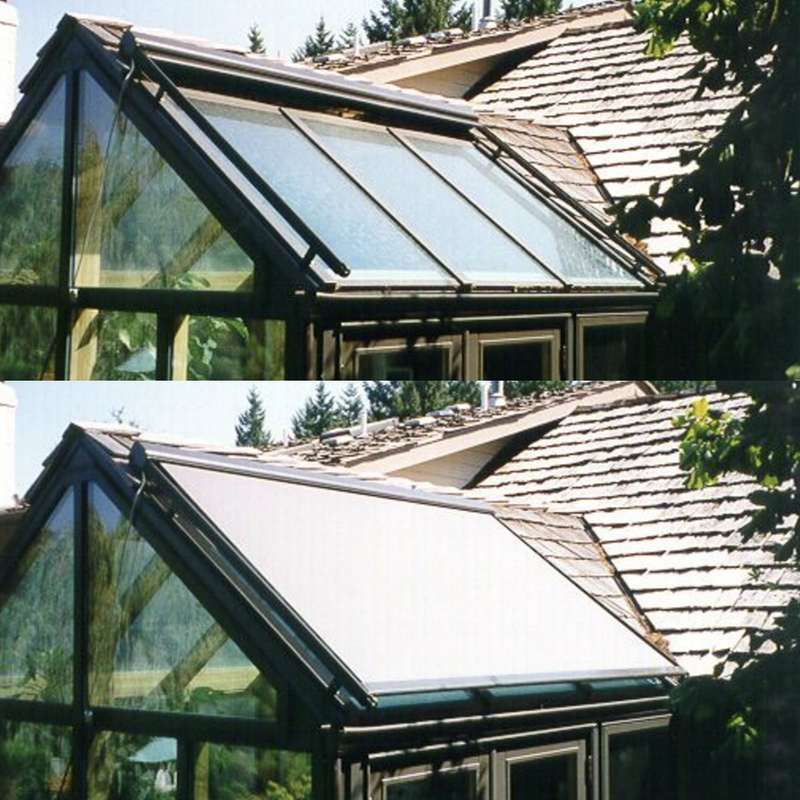 In homes, the addition of excess sunlight can cause temperatures to vary in extremes, especially once the sun goes down. Often this causes the living space to remain hot. Waagmeester awnings and sun shades allow you to lessen or even block out sunlight to maintain a temperature that best suits your needs. Managing excess sunlight and maintaining a steady temperature can save you money. Your building's energy efficiency and utility costs, like air conditioning, can be better controlled with the addition of sun shades, curtains, shade sails and awnings from Waagmeester Awnings & Sun Shades. An exterior awning is a simple and effective way to enhance the look of your residential or commercial property. Waagmeester Awnings & Sun Shades can create anything from bold, bright, unmissable accessories or we can do color matching and sizing so subtle that our awnings and sun shades will be practically camouflaged on or within your space. 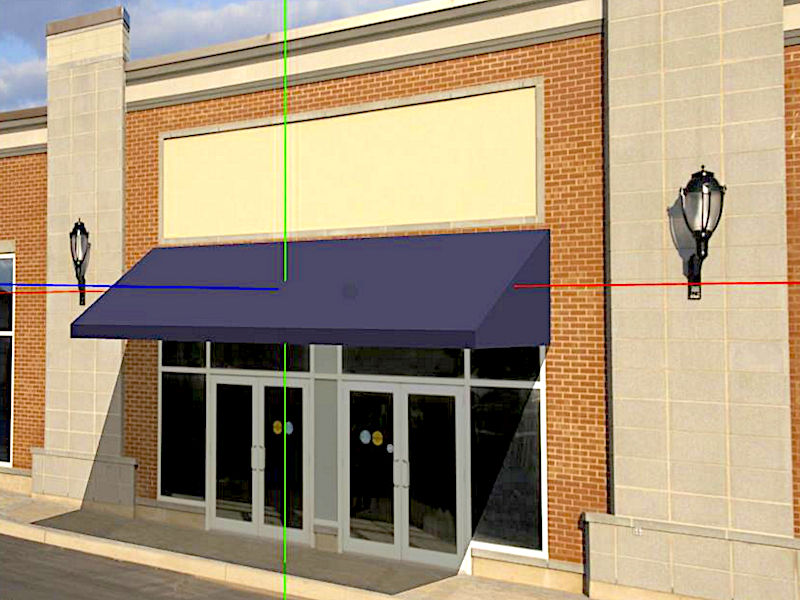 When it comes time to part with your home or business, our awnings and sun shades add value that your potential buyer can’t miss. 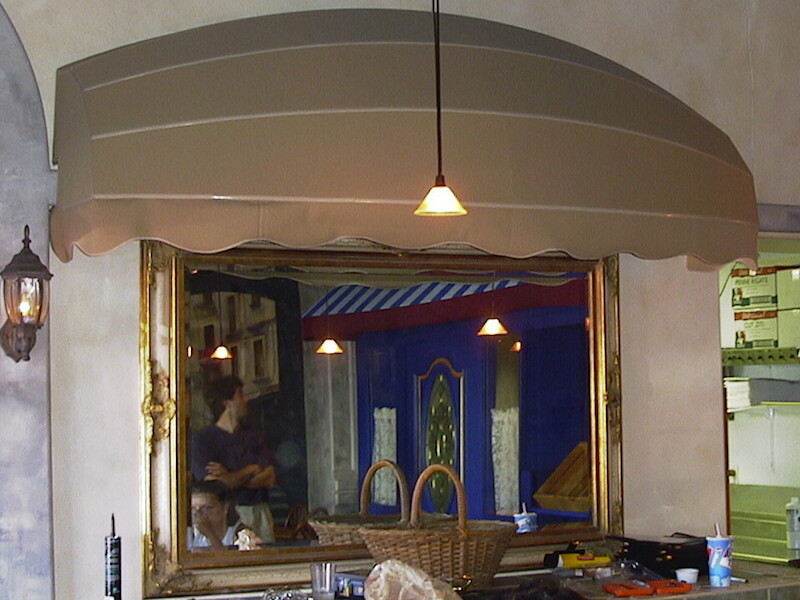 Visiting a home or business with high quality, durable and attractive awnings and sun shades makes and impression. The style and functionality of Waagmeester products can be selling point that adds to the value of your property. ​For any business, being seen, noticed and found is of crucial importance. Awnings and sun shades are an effective means of letting your existing customers and your future customers locate you. Your branding, logo and name can all be displayed both on internal and external shades and awnings. And consider this, more and more online services are utilizing photos to correspond with review and map websites and apps for tablets and smartphones. When a customer is using the web or an app making plans on where to spend their money, make sure that they can see your business with your name displayed clearly. With a branded awning from Waagmeester, you’ve made it that much easier to get them in the door. Your name and logo displayed prominently can potentially attract customers passing by on foot, bike or vehicle. 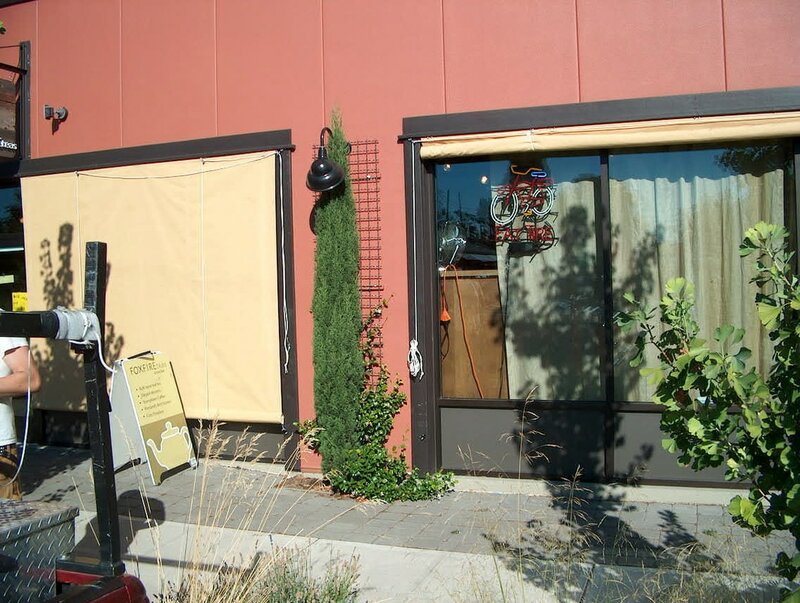 You may only have a few seconds to get their attention and interest; our awnings and sun shades can help do just that. 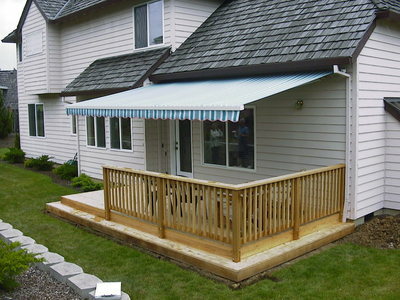 ​Our quality constructed awnings, sun shades and screens have a host of features that make them the best in industry. 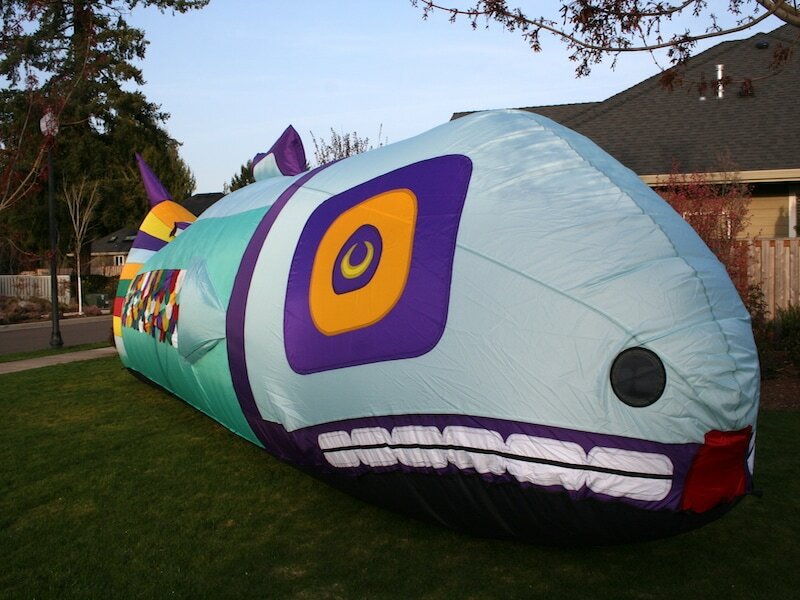 We highly recommend you give us a call at 503-288-8391. Click here to email us or fill out our contact form to learn more. Here are just a few of the features that make our products so special. So much of what we do is made by hand right here in Oregon by masters of their crafts. As a third generation, family run business, quality construction has always been and will always be an indispensable feature of the products we design and create. Waagmeester quality is clear to see and our products are built to last. 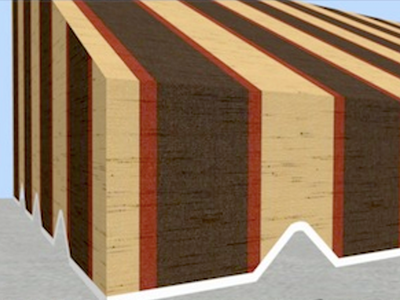 In conjunction with our superior quality construction, we use only state-of-art materials for our products. This includes fabrics, frames, hardware, motors and anything that goes into a Waagmeester product. Many of the products we create are made with materials that are resistant to mold, mildew, water and sunlight. Many of our products are even fire resistant. 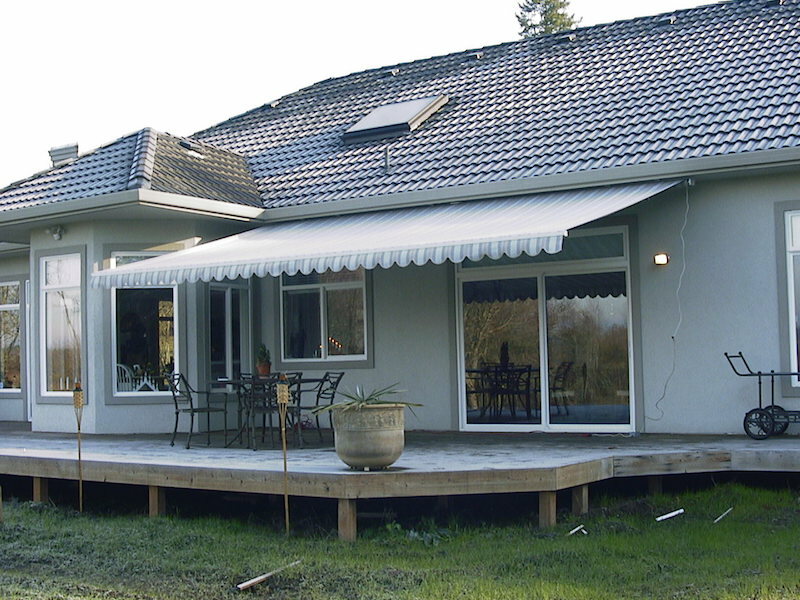 Waagmeester offers both automated and manually operated awnings and sun shades. Back when Bud Waagmeester founded our company, awnings and shades were often rolled and tied. Today we use lateral arms for manually operated retractable awnings. We also offer fully automated awnings for effortless deployment and retraction. The same applies to our sun shade and screen products. Automation can make the operation a breeze. Our manual shades raise and lower smoothly and easily. ​Once you’re ready to see what we can do for you, the Waagmeester Awnings & Sun Shades team can create customized computer generated 3D visualization renderings. You’ll be able to do more than imagine what your home or business will look like with new awnings and sun shades. With just a photo or two, our design specialists will show you a world of options – color, size, depth, light and shadows – it’s as real as it gets next to having an actual Waagmeester awning or sun shade added to your property. Click here to learn more about our visualization renderings. Over 70 years ago, Bud Waagmeester founded his canvas awning and sail shop on Alberta St. in Portland, Oregon with one thing in mind – quality products matched with customer service that exceeds expectations. Bud learned his craft in the US Navy, but his work ethic and drive were part of him long before. While in the Navy Bud made covers for lifeboats, winches and turrets. His quality and skills were noticed and eventually Bud was hand making sails for Admirals’ pleasure boats. Having worked since age 13 it was no surprise that after his naval service, Bud used his skills and determination to open his own business. 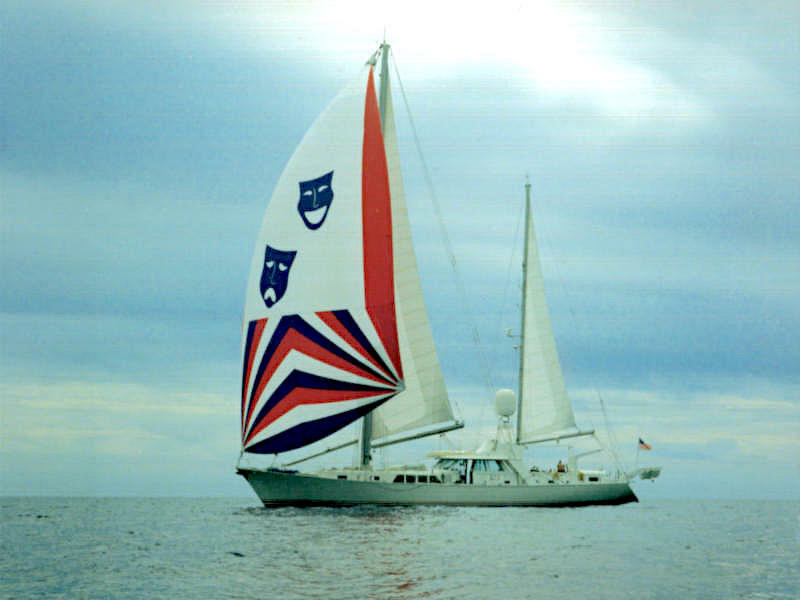 In addition to making practical and functional residential canvas products, Bud’s naval background naturally led him to creating canvas products and sails for fishermen and maritime companies along with being a specialist for professional and amateur sailing enthusiasts across the country. Waagmeester Awnings & Sun Shades has been a family venture since its founding. Bud’s sons Steve and Dale would soon join him in the business. A third generation would step up to the plate when Bud’s grandson Erik began learning the family craft. Innovation, creativity and, of course, the highest possible quality have been staples of the Waagmeester team for over seven decades. 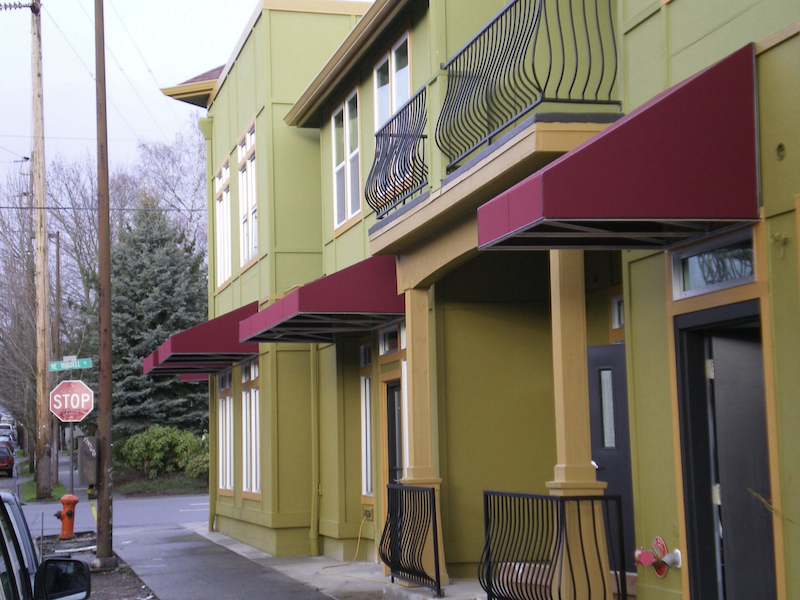 Waagmeester Awnings has since relocated to a new, larger facility in Wilsonville, OR allowing them even more room to create and innovate. Visit the new facility, talk to the design specialist, see the Waagmeester process in action and you’ll understand why service, quality and value aren’t just words to the Waagmeester team… they’re the founding principles of a family business that looks forward to many more decades of designing and creating products that exceed industry standards and service that makes each and every customer feel like a friend and member of the Waagmeester family. ​Throughout our website you'll find numerous examples of the quality work Waagmeester Awnings & Sun Shades offers our customers. Click any of the images to view an enlarged version. You'll find ways to contact us on every page of our website, either by phone, email, or via our online estimate request or contact forms. We invite you to reach out to us to discuss the options we can offer your home or business.